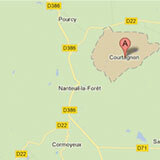 Come and discover or rediscover Courtagnon and its remarkable setting. You can even take a stroll through the vineyard or explore the forest. Sharing our passion for creating champagne is an integral part of our values. We will be delighted to welcome you to our vineyard and to help you choose from our range of cuvées. Don’t hesitate to contact us if you require further information, if you want to know the prices or arrange a meeting!